We just got Mom an over bed table this year, about three years into her being relatively limited to a hospital bed in our home. Overbed tables are the tables you see in hospital rooms that are on wheels and slide “over” the bed so patients can eat and place things on them. This has been helpful because it gives us a nice wide surface for setting things on – Mom’s lunch, water, tissues, remotes etc. We also Skype my family on my laptop a few times a week and I can set the laptop on the table and raise it up and down to get the angle and proximity close enough for Mom to see our family on the screen. Mom was diagnosed with dysphagia (difficulty swallowing) almost three years ago. Shortly after her diagnosis, my brother got us a Blend-tec – high-powered blender with like 4 horse power. It’s loud as heck, but a completely and total life-saver. It’s digital interface currently shows we are nearing 1,700 blends since we started. I cook ALOT for mom and this is possibly the handiest device. It blends to the smooth and creamy consistencies we need for Mom’s food and has settings for dips, soups, smoothies, and more. We have two weighted blankets for Mom, one that is smaller and 5 lbs and one that covers her whole body and is 12 lbs. We use them to help provide pressure and feedback to Mom’s muscles when she has spasms or tremors, and also to help her relax and fall asleep for naps. Weighted blankets are typically patchwork jobs where each ‘square’ is filled with tiny beads, giving the blanket ‘weight.’ We used a weighted blanket with Mom for almost 6 years and it is a daily go-to. We have three neck pillows that vary in size which Mom uses in bed and when she is in her wheelchair. 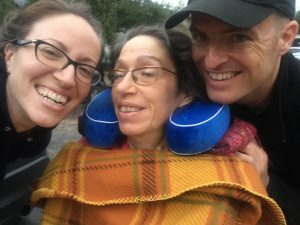 Very weak neck muscles and lack of general strength makes it hard for Mom to hold her head up on her own, so neck pillows provide the support and stability she requires, especially when sitting up. They are comfortable and help Mom keep her head up to be able to see and enjoy what’s in front of her, and also help us keep her throat straighter for easier breathing and safer eating. It took a long time to grapple with early onset incontinence which Mom experienced in the 40s because of her MS. Not quite ready to have her start wearing briefs, I would spend hours carrying or walking her to the bathroom to navigate our way through cramped quarters and sit on the toilet hoping she would pee. Finally when it became apparent that she was soiling everything under the sun – bed, recliner, car, wheelchair – we caved and got a bedside commode and briefs. A bedside commode is simply a sturdy plastic and steel toilet that can be placed anywhere for use. Nowadays we change Mom’s diaper in bed, but if she needs to go #2 and wants to sit on the potty, we’ll grab the commode and pop her on to let gravity assist her. We also used the commode on road trips with her – we would find an out of the way place to park in private, get the commode out and put her on it to change her diaper. Bedside commodes are super light and easy to clean. You might be saying, “Wait a minute, a Roku isn’t caregiving equipment,” to which I would have to beg to differ. The streaming device we have plugs into the wall and then hooks to the TV with an HDMI cable, and helps us find a variety of fun and engaging things Mom can watch daily. She spends a lot of time watching TV and we are able to stream Netflix, PBS, Hulu, and AmazonPrime with the Roku, as well as Pandora, a music app where we play relaxing music while Mom naps. Other streaming devices like ChromeCast and FireStick serve the same purpose and behave relatively the same way. 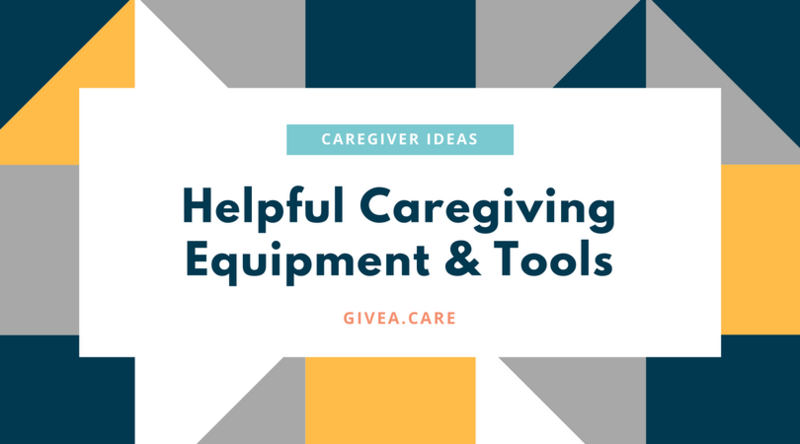 Thanks for checking out these caregiving tools and equipment ideas on Give a Care. What would you add to the list?